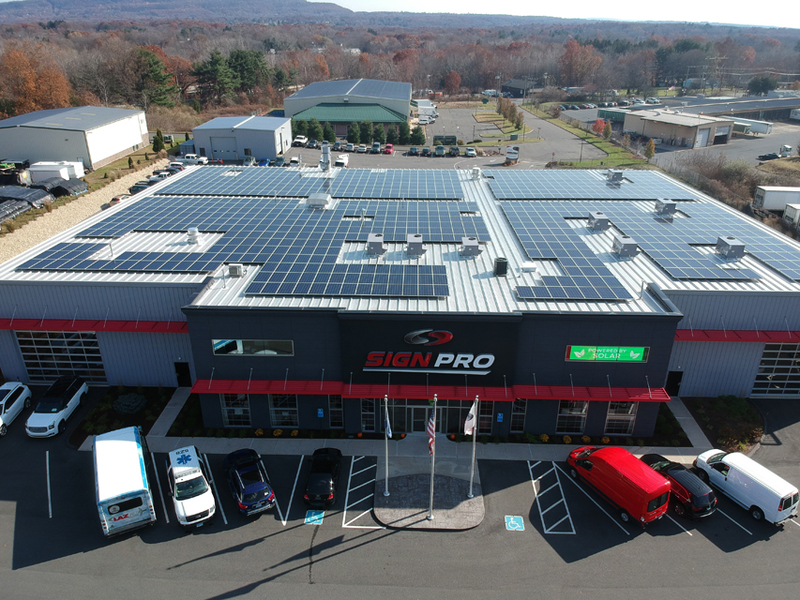 This past November, Sign Pro, a full-service sign company based in Plantsville, Connecticut, welcomed state officials, town leaders, local business owners, and the press to a special ribbon-cutting ceremony celebrating the installation of 890 solar panels onto the roof of their four-year-old building. The array of panels, which can generate 293 kilowatts, is providing power to the entire facility at a much lower cost than before. Sign Pro Owner Pete Rappoccio is a vocal proponent for sustainability and renewable energy, and he wanted to demonstrate to the invited guests the importance of energy conservation today. The solar-powered panels and components were procured from a Connecticut company who guarantees its product and labor for thirty years. They financed the purchase of these panels through Greenworks Lending and Connecticut’s C-PACE program. They used no upfront money and are instead repaying the job over fifteen years as a special tax assessment on the project. Electrical power was costing them about $5,200 a month. Since some federal laws and benefits were going to be changing at the end of 2018, Rappoccio knew the time was right to incorporate solar panels onto the roof of the new building. “These panels will provide the company a significant up-front tax incentive,” says Rappoccio. “At the end of the month, the projection is a 35 to 40 percent in surplus overage, and that would be in reimbursement from our local power company. So instead of paying for your power directly to your electrical provider, you’re repaying back the loan through reimbursements and the savings you realize in utilities (for the same dollar value). Sign Pro’s history involves growth and thinking about the future. Rappoccio started the company thirty years ago out of a bedroom in his parents’ home. “I worked for a construction company painting cranes, trucks, trailers, dumpsters, etc., and needing them lettered once painted, I started the sign business for work at night,” he says. Two years later, while still working full time and going to college, he moved the business into a 200-square-foot garage with no running water. Eventually he was able to focus solely on signs, bringing four people onboard and expanding to a 3,500-square-foot shop and then an 11,000-square-foot building. Today their facility is 40,000 square feet filled with state-of-the-art equipment. They have sixty-three full-time employees (including facility maintenance and custodial staff who keep the facility immaculate). Rappoccio has always been adamant about lean management, procedures, safety, and sustainability, and it was this philosophy that influenced the architectural style of their new facility. Installation of all the solar panels took forty-five days, then inspections and final switch-over completed the process. They have experienced no difficulty since flipping the switch to solar. They are using 1500-amp, three-phase electrical service and are powering a wide range of production equipment—HP 3200, 850, and 750 wide format printers; a Zünd flatbed production cutter; two MultiCam CNC machines; six welders; and a thirty-five-foot spray booth. They are running everything fourteen hours a day and are experiencing no hiccups. 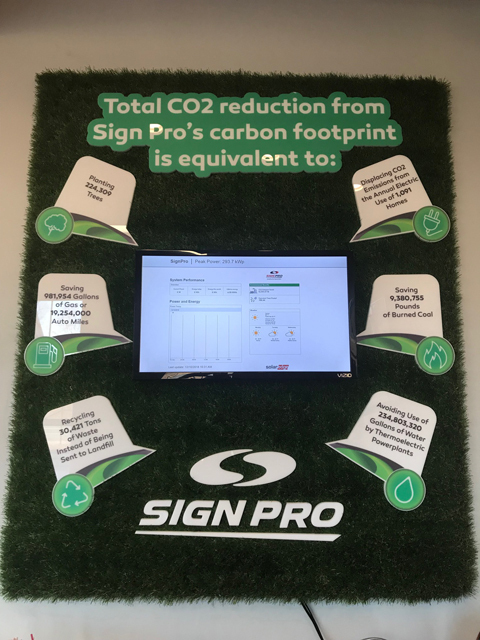 Today Sign Pro has made quite a gargantuan leap from its humble beginnings, as they are now one of the biggest companies in New England generating this much power at such little cost. The statistics show they are giving back enough power equivalent to what 1,340 houses generate. The amount that is saved power-wise is reinvested back into the company—either through investing in employees and training and creating more jobs. Due to their energy savings, they’re looking into adding a second shift of manufacturing. It’s a big system, and it’s generating a big deal. Rappoccio and his company have heavily involved in promoting the benefits of sustainable energy and going off the grid. They do a lot of work within the state of Connecticut in public and private sectors, working several Colleges, Universities and corporate national clients that have a requirement for sustainability, recycling, and going carbon neutral as their goals. Sign Pro is also giving sustainability presentations to local organizations and schools. Rappoccio has also been invited to speak at the Legislative Office Building this year to talk about solar and lean manufacturing practices. A digital kiosk shows customers live updates on the kilowatts of power the panels are generating. The kiosk is also used internally by Sign Pro. “So if you were to have an outage or a panel that is not generating the same amount of power next to it, the kiosk will show us this, and we can troubleshoot and determine the exact issue,” says Rappoccio. Sign Pro’s green efforts don’t stop at solar panels. They’re currently finishing their next phase of sustainability—switching out their HiBay T5 fluorescent lamps in their warehouse with IBG 24L and L/B T8 LED lighting. They’ve increased the number of light and footcandles in their fabrication shop, warehouse, and installation bay. They also recycle all their aluminum, steel, polycarbonate, and acrylic materials. Along with promoting renewable energy, the November ribbon cutting ceremony had another motive. The economic climate in Connecticut is in a bit of flux these days, with many businesses thinking about leaving and going elsewhere. By making the investment to put the solar panels on their roofline, Rappoccio basically reaffirmed to everyone in the area that they weren’t going anywhere. “We’re not about being the biggest company; we’re about being the best company,” says Rappoccio. “So looking at where we want to be in the future, going solar helps put us a step closer in that direction. “When we had our event, we were able to invite those businesses and the community to come out and celebrate the town and show what we’re doing. Our executives here know that not every business can make the capital investment that we made in terms of doing this at their building. But our message is that if you can’t do something as big as solar, then recycle. Make sure your people aren’t doing waste. The Sign Pro company definitely lives up to its tagline in many ways… #ExceedingYourExpectactions.